Sports turf managers could halve the time and cost of line marking this season, with a new approval to mix Primo Maxx with line marking paints. Independent trials by STRI have shown the opportunity to retain line visibility for up to 50% longer, compared to line marking alone. Mixing the turf growth regulator with line marking paint can suppress grass growth for up to six weeks and has been shown to give significantly better retention of line colour and visibility for longer. Furthermore, there is no damage to the playing surface associated with total herbicide applications, which can allow weeds to ingress and create the need for re-sowing at the season's end. Primo Maxx is approved for use as a pre-mix with paints for wheel-to-wheel application or with spray line marking applicators. 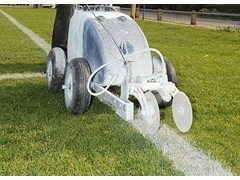 The combination has been extensively tested with a full range of commercial paints and line marking equipment. "At the end of the season, the turf simply reverts out of regulation with no damage or lasting effects," reports Rod Burke of Syngenta. "There is no cost or effort of re-seeding, no bare soil for weeds to establish and, if sports turf is being used for another event over the summer, new lines can be quickly and easily put in place." STRI trials have shown the lines marked with paint mixed with Primo Maxx (foreground) remain clear and visible up to 50% longer than line martking paint alone. Primo Maxx should be used at a rate of 2 ml per litre of line marking paint applied, or 40 ml in a 20 litre tank, for example. The cost of the Primo Maxx is less than 15p per litre of paint mix used, compared to the paint cost of around 40p to £1.80 per litre, depending on product choice and concentration used. Glufosinate ammonium adds a cost of around 33p per litre of paint mix for initial marking. "Turf managers who use Primo Maxx on sports playing surfaces have already recognised the improvements in turf density, rooting depth and the added strength of to resist the wear and tear of heavy play, along with up to 50% reduction in mowing requirement and clipping yield," reports Mr Burke. "Now, Primo Maxx can make a further contribution to cutting costs and simplifying management, by reducing line marking requirement by up to a half."